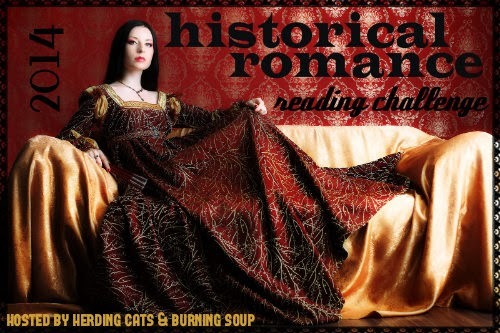 herding cats & burning soup: 2014 Historical Romance Reading Challenge-- JAN LINK UP! 2014 Historical Romance Reading Challenge-- JAN LINK UP! Annnd the Historical Romance Reading Challenge has officially begun!! What are yall reading first?! Any reviews you do for historicals in January just come back to this post and link them up! Also! We have a FB group for the challenge if you'd like to JOIN. The goal is to read at least 12 Historical Romances! You can sign up until Dec 1st, 2014-- Add your blog/contact info to this POST. Then get to reading! Once you've read and reviewed a title add it to the linky below. There will be a new post the 1st of each month. It'll be linked over on the left side of the blog's page as well. Yall are also more than welcome to chat about the books you've read in the comments, to visit each others reviews and like/comment on those, etc. It's always fun to chat about what you're reading so don't feel shy about it! If yall are interested in a FB group for the challenge let me know and I'll get one set up. We also have a FB group set up if yall'd like to chat there, share your reviews, ask for suggestions. Just ask to JOIN and I'll get you approved. It's a closed group so only members can see what's posted! Add each review you read to this list. For "Link Title" include your blog name or XYX@goodreads then the book title. (ex Anna@herding cats--Her Highland Warrior) The link should go directly to the review.